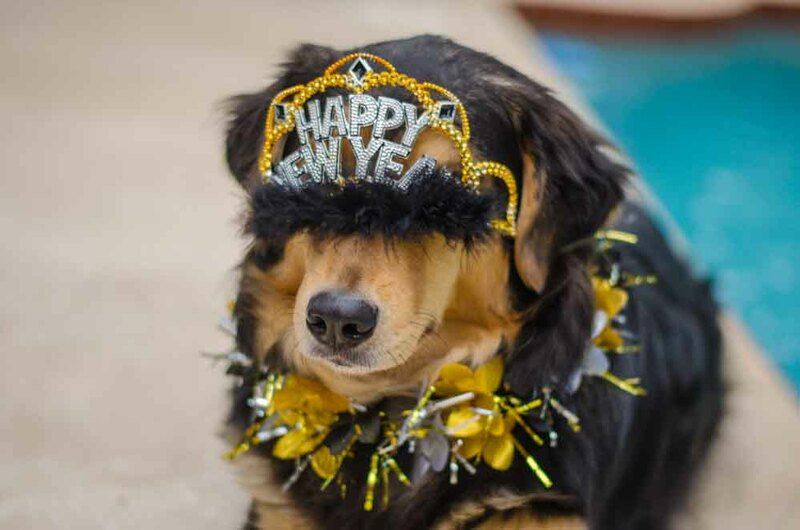 Ringing in the new year with family and friends is always a good time, but something happening to one of your furry friends during the celebration would be a terrible way to end the night. If you’re wondering what you can do to keep your pets safe on NYE, check out some of the simple tips we’ve compiled below. Take your dog on a long walk or run in the afternoon or play with your cat for 30+ minutes. If you tire them out during the day, they’re more likely to rest (and probably sleep) through the festivities. If you’re concerned about your pet getting stepped on by party goers, choking on decorations, or just getting too rambunctious in general, think about separating them from the commotion of the party area. Put your cat in a cozy and familiar room with their litter box, food and water, toys and bed. You can do the same for your dog. Also try to minimize taking them outside, even for potty breaks. There’s a good chance that there will be a lot of festivities happening at your neighbor’s house as well, with people going in and out and potential loud noises and fireworks which provides your dog the opportunity to bolt. If you have to take them out, make sure they are on a leash, even if they’re going into a fenced backyard. It’s a good idea to update your pet’s ID tags and microchip information a few days before the party. If for some reason your pet gets out of the house, they’ll at least have all the accurate and updated information on them so that you can be contacted. It’s also smart to outfit them with a reflective collar so that you can see them in the dark, you could even invest in a GPS to attach to their collar so that you can maximize your chances of finding them quickly and easily. It’s important to stress to family and friends in the house that they do not feed your pet any kind of alcohol or table scraps. Cats and dogs’ bodies are not equipped to process alcohol in the same way ours is, and even one mixed drink can be fatal for a small dog or cat. The same can be said for people food. Fatty and greasy foods can make animals ill, and many human foods contain ingredients that are toxic to dogs and cats, such as onions and garlic. The best way to keep them healthy is by eliminating the risk and ensuring they’re only eating, and drinking things meant for them. If you’re planning on leaving the house to celebrate, that means your pets will be home alone. There will be loud, confusing noises coming from outside and they are probably going to feel anxious, and many pets (especially dogs) will chew when they feel uneasy. Make sure anything harmful is out of reach, like plants, foods and medications. Also make sure any exits to the home, like windows or a back door, are secured so that they can’t run out of the house. If fireworks are typical in your area, think about getting your pet a ThunderShirt. It’s a weighted vest that works similarly to swaddling a baby, providing gentle pressure similar to a hug, and is very effective for many cats and dogs.